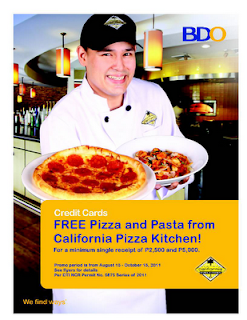 BDO CPK Pizza & Pasta Treats ~ Philippine Freebies, Promos, Contests and MORE! Redemption is valid for dine-in. Take-out will only be allowed upon a minimum purchase of P200 (plus 10% packaging charge) at CPK outlet of redemption. Not valid for delivery.